Team New Zealand have made up solid ground on the leg three frontrunners in the Volvo Ocean Race as they look to minimise the damage from earlier poor decision making. The Camper sponsored boat moved up to third place yesterday on the long beat to Sanya after slipping as far back as fifth following a disastrous passage through the Malacca Straits. 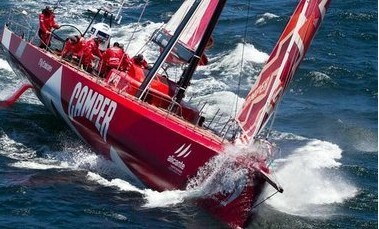 Camper’s progress was not the only positional shake-up, with Groupama overtaking Telefonica for the lead late yesterday. In last night’s position report the French-flagged boat had a 10 nautical mile advantage over Telefonica, with Camper 38nm further back. There is still the potential for further movement over the remaining 900nm to Sanya as the fleet approaches the Vietnam coast and a building monsoon weather system that will deliver strong head winds and steep seas. The crews face a tactical decision of whether to head in close or stay further out to sea. The coastal route is higher risk/higher reward offering the potential of much better breeze strength and angle, but also the risk of strong currents, wind shadow and obstructions such as fishing boats and nets. The offshore option is less complicated and lower risk but generally does not offer the large gains that inshore potentially does. Camper skipper Chris Nicholson said as they headed into strong head winds they were weighing up the issue of how hard they could push the boat. "In a decent blow the difference between pushing the boat that little harder or not could easily equate to [gaining another place]. But it could also equate to the difference between a leg-ending breakage or not so it’s a pretty fine balancing act," he said. "We’ve got plenty of confidence in this boat though, and a lot of hard upwind miles behind us so we’re relatively comfortable with the type of conditions that are coming up. "We just need to keep on chipping away, sailing fast, not making any mistakes and taking any opportunities that are presented to us."